Every 53 minutes, a person in the United States dies in an alcohol-related traffic accident. That's 28 lives lost each and every day. The National Institute on Alcohol Abuse and Alcoholism reports that nearly 88 percent of those aged 18 and older have consumed alcohol at least once in their lifetime, and about 57 percent have had an alcoholic beverage in the past month. These startling statistics prompted us to look into the prevalence of drinking and driving in America with our own original survey. We asked over 2,000 U.S. residents to be honest about their history of driving while under the influence of alcohol. Our findings and research below reveal the alarming rate of people getting behind the wheel after drinking, and show the need for education and prevention of this deadly habit. From 2003 to 2012, there was a nearly 21 percent increase in women 18 and over arrested for driving under the influence (DUI) and an 18.6 percent increase in women arrested for drunkenness. Despite this increase, men were still responsible for the majority of DUI arrests in 2012 – almost 650,000 compared with about 211,000 for women. These statistics correspond to our survey results that show 45 percent of men and 35 percent of women admitted to driving drunk. Driving drunk doesn't just result in arrest. In 2014, 9,967 people died in alcohol-related traffic accidents. Sixty-four percent of those fatalities were drivers with a blood alcohol content (BAC) level of 0.08 or greater, and 36 percent were passengers and nonintoxicated drivers. While it's not illegal to drive with a BAC of 0.07 or less, driving while "buzzed" can be dangerous and have significant consequences. However, many don't recognize this as a danger and don't realize how few drinks it takes to impair or legally intoxicate a person. Over 69 percent of our respondents admitted to driving after consuming some alcohol. 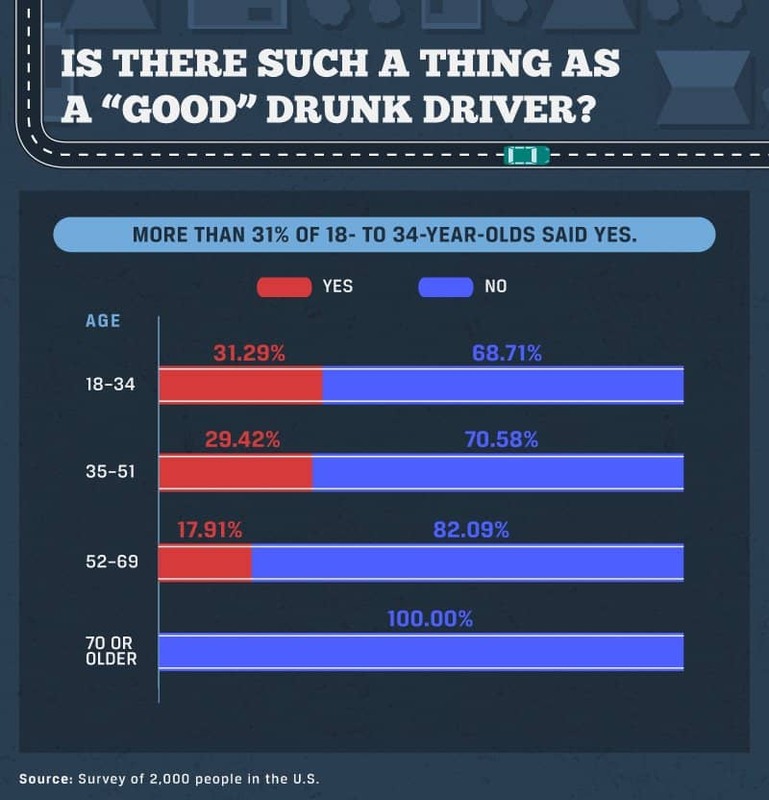 About 65 percent said they believe they are OK to drive after having one to two drinks, with another 15 percent saying three to four drinks is acceptable. In reality, just one drink may impair a person's ability to drive. Raising awareness of buzzed driving is crucial. Students at Brigham Young University created an ad campaign that helped spread the message, and police departments frequently warn that "buzzed driving is drunk driving" during holidays to keep the roads safe. There are also frequent news stories of fatal accidents caused by drivers who thought they could drive safely after drinking. Drunk driving happens all over the United States, and there is no "safe zone" from its dangers. There are, however, regions that show a greater prevalence, and this is where increased education and awareness is needed most. Nearly 37 percent of our respondents admitted to driving drunk at some point in their lives, with the Midwest being the region with the highest proportion (41.6 percent). 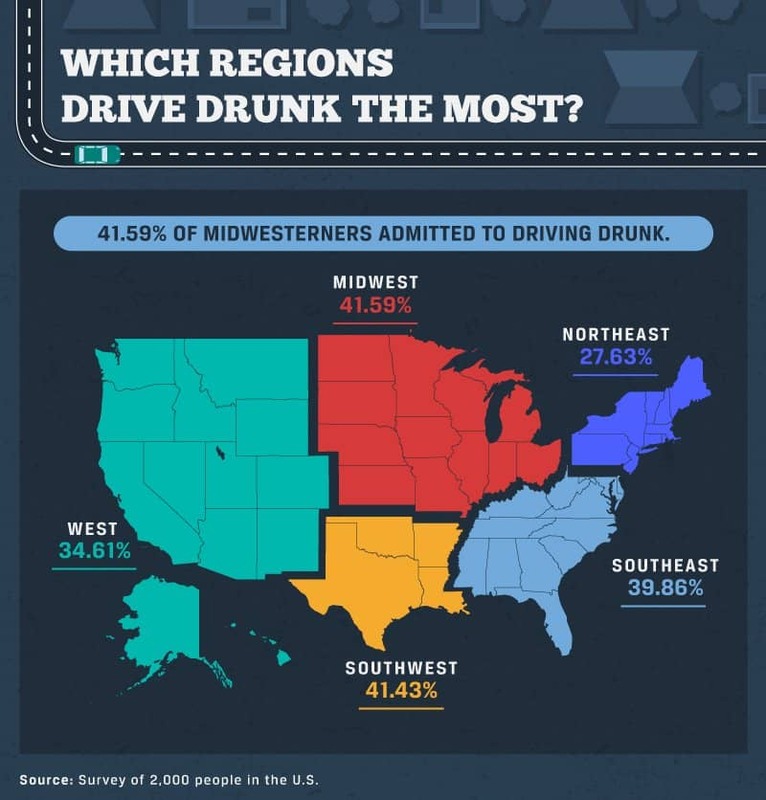 A study covered by USA Today revealed that three of the 10 most dangerous states for drunk driving were in the Midwest: North Dakota, Wisconsin, and South Dakota. The Centers for Disease Control and Prevention (CDC) reported that North Dakota had a drunk driving–fatality rate per 100,000 people of 11.3 in 2012, which is over three times the national rate of 3.3. The rate in South Dakota was 5.7, a 53 percent difference from the national rate. Wisconsin is the only state where driving while intoxicated is not a misdemeanor – or even a "crime" –for the first offense (unless a passenger in the vehicle is under 16). Many people and advocacy organizations, such as Mothers Against Drunk Driving (MADD), take issue with Wisconsin's operating while intoxicated (OWI) law – especially given the frightening national statistic that drunk drivers have driven while intoxicated more than 80 times before their first arrest, according to MADD. Wisconsin lawmakers did make a move in the right direction with a new law that will allow officers to require first-time offenders to undergo a blood test to check for alcohol levels. In addition to stricter laws, other strategies for reducing and preventing drunk driving that all states and areas of the country can implement sobriety checkpoints, ignition interlocks, and school-based instructional programs. Almost 53 percent of people who reported drunk driving on at least one occasion consume between one and four alcoholic beverages per week. The prevalence goes down from there but then escalates for those who drink over 16 beverages per week (over 7 percent of our drunk driver respondents). Often the more regularly or frequently a person drinks, the greater the chance he or she will get behind the wheel after consuming alcohol. 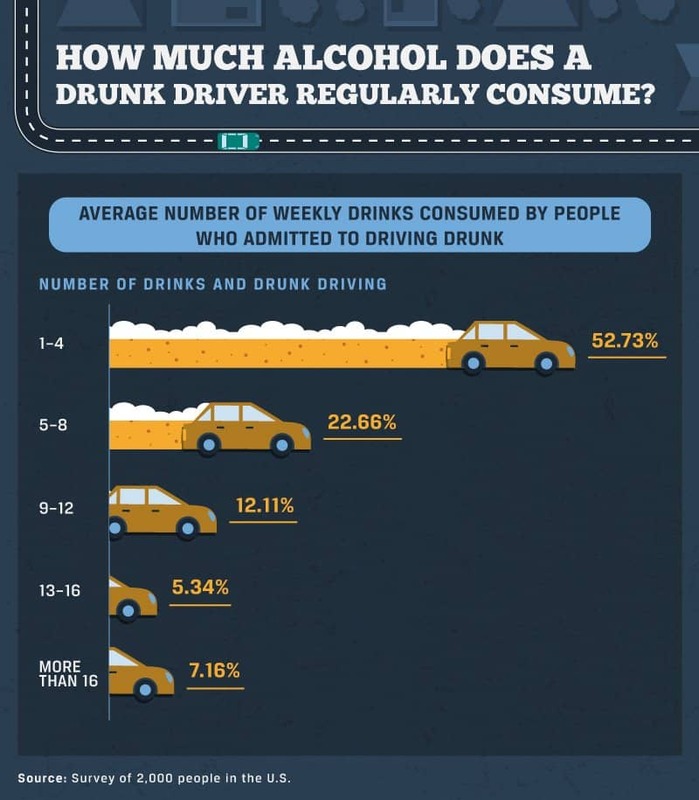 Our survey results indicate a pattern for this, with nearly 86 percent of our respondents who said they drink more than 16 alcoholic beverages a week also admitting to drunk driving. The CDC defines heavy drinking as consuming eight or more drinks per week for women and 15 or more drinks per week for men. Excessive drinking and alcohol abuse can lead to alcoholism or a physical dependence on alcohol. Is Driving Drunk Ever Safe? A drunk person should never drive, no matter how good of a driver they think they are. Unfortunately, nearly 32 percent of our respondents aged 18 to 34 said they believe there are people who are good at drunk driving. This age range is connected to college-aged students, presenting a dangerous connection between frequent drinkers who may also be overly-confident drunk drivers. Drinking among college students is extremely prevalent. In 2014, almost 60 percent of full-time college students aged 18 to 22 said they consumed alcohol in the past month, nearly 38 percent participated in binge drinking in the past month, and over 12 percent reported heavy drinking (consuming at least five drinks in one session on five or more occasions per month) in the past month. All of these numbers were higher than noncollege students of the same age. One of the worst mistakes a drunk college student can make is getting in the driver's seat of a vehicle. Education and awareness of the dangers of drunk driving are vital to reducing the incidence of drunk driving. Following the DUI arrest of a University of Georgia defensive lineman, football players there were vocal about supporting their fellow teammates in obtaining a ride after they've been drinking. At Hartwick College, there have been programs to warn students of the perils of drunk driving, including a mock DUI crash and a simulated drunk driving event. 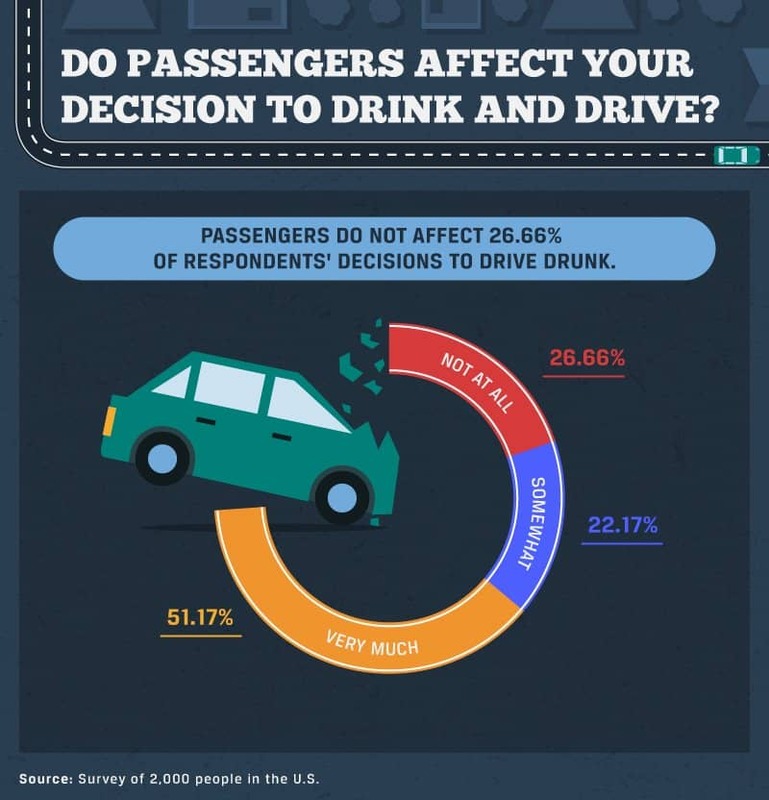 Over 73 percent of our survey respondents said that having passengers in their vehicle affects their decision to drive drunk. But what about the other drivers and their passengers on the road? In 2014, passengers riding with a driver who had a BAC of 0.08 or higher made up 15 percent of all fatalities caused by alcohol-related crashes, while occupants of other vehicles and pedestrians/bicyclists composed 20 percent of drunk driving deaths. One woman in South Florida is suffering the consequences and pleading for forgiveness for her poor choice to drive drunk haphazardly in 2013. Minutes before crashing into another vehicle and killing its two occupants, she tweeted "2 Drunk 2 Care." A Texas State student was arrested for allegedly drunk driving and crashing into a vehicle with a man and his pregnant wife; the man and unborn child died. In Maryland, a former federal officer was sentenced to 10 years in prison for killing a woman in a head-on collision while driving drunk. These are just a few of the stories of lives tragically lost by drunk drivers. Many of the victims' families request more awareness for drunk driving and aim to educate the community on how quickly and drastically lives can change when drinking and driving are combined. With 28 people dying every day in America due to drunk driving, it's essential that our country increases the education and awareness for drinking and driving. While certain demographics, such as college students, have a higher risk for driving while under the influence of alcohol, our survey revealed that no group is "safe." 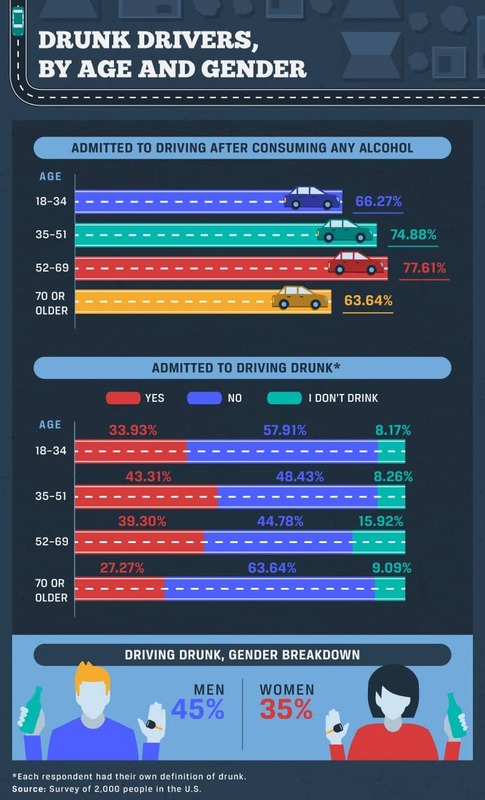 Over 60 percent of each age range admitted to consuming alcohol and then driving, and 35 percent of women and 45 percent of men reported driving drunk. The legal penalties for alcohol-related vehicular manslaughter are steep â€“ in many states, prison sentences can be as long as 20 or 30 years. In Alaska, an airman with a BAC of 0.20 faced 99 years in prison for killing a woman in a fatal accident; he was sentenced to a maximum of 30 years. Of course, a prison sentence doesn't compare with the outcome for victims who lost their lives. Police departments, organizations such as MADD, families of victims killed by drunk drivers, and concerned citizens all across the country are speaking out to encourage those who have been drinking to not get behind the wheel. National, state, and community-wide interventions like sobriety checkpoints and ad campaigns can reduce the incidence of drunk driving. Don't let the effects of alcohol cloud your judgment and ruin your life and possibly the lives of many others. If you are worried about your alcohol consumption and ability to make decisions regarding drinking, reach out for support today. Call 1-888-919-3845 to find out more about -alcoholism treatment options today. We surveyed 2,000 people in the United States to ask about their experiences with consuming alcohol and driving. Feel free to share the images and information on this page freely. When doing so, we ask that you kindly attribute Alcohol.org so your readers may learn more about the study, data, and view any additional assets.